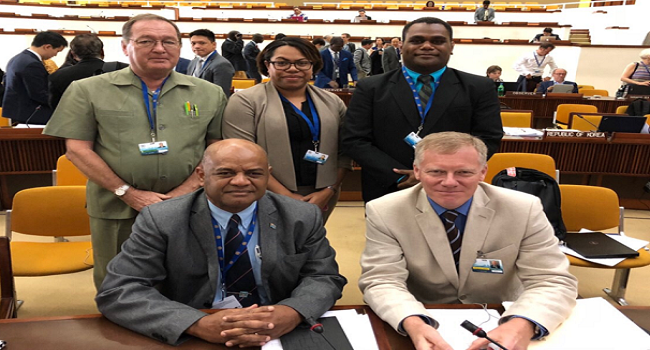 Permanent Secretary for Lands and Mineral Resources, Malakai Finau this week led a Fijian delegation to the 24th Session of the International Seabed Authority in Kingston, Jamaica. Finau stressed the need for socio-economic impacts on Small Island Developing States to be reflected in the Draft Regulations for Exploitation in the Area. He adds given the vulnerabilities of SIDS and their reliance on the oceans as a source of livelihood, the draft regulations needs to reflect this. The issue of the royalty payment was also highlighted and other benefits. The meeting is important as Fiji is vying for re-election to the Council for continuity and to further strengthen our engagement at the ISA. Fiji delivered interventions on the draft regulation during the Council meeting with regards to the implications of deep seabed mining on the marine environment, financial model and contract terms, rights and obligations of contractors. The session will continue next week in which the Assembly will endorse and adopt some of the issues discussed during the Council session.